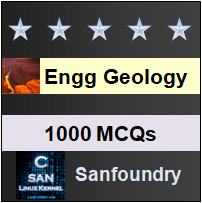 This set of Engineering Geology Multiple Choice Questions & Answers (MCQs) focuses on “Mountains”. 1. What is the term that refers to a continuous belt or zone of rocks that has suffered complex deformations through geological ages? Explanation: In geological sense, the term mountain refers to a continuous belt or zone of rocks that has suffered complex deformations (Like folding and faulting) through the geological ages. These may or may not be having high relief at present. 2. What is the term used for a linear type of mountainous structure characterized with two slopes on opposite slides? Explanation: The term mountain range is used for a linear ridge type mountainous structure characterized with two slopes on opposite sides and commonly (not necessarily) culminating in peaks. Explanation: When a number of mountain ranges and ridges continue for extensive distances for thousands of kilometres maintaining their characteristic features throughout, the resulting complex structure is called a mountain belt or chain. 4. How any broad classes of mountains are recognized based on mode of origin? Explanation: Two broad classes of mountains are recognized on the basis of their mode of origin- tectonic mountains and relict mountains. Explanation: Tectonic mountains owe their origin to severe intern forces- the oregenic forces arising from within the Earth. These mountains are the most common in geographic distribution and often very complicated in geological structure. Explanation: The mountains considered under the tectonic mountains are volcanic mountains, fault block mountains and the folded mountains. Residual mountains are totally belonging to different class of mountains. Explanation: Relict mountains are the ones which have been formed by the age-long erosion and weathering of pre-existing surface features of the Earth like plateaus, plains and of even original complex tectonic mountains. Explanation: Mountains resulting from the depression or elevation of blocks of the Earth crust on a large scale due to faulting; these elevated structures are commonly called fault block mountains. 9. Which mountains are called as complex mountains? Explanation: The folded mountains are also called as complex mountains. During and after their formation, these mountains have been repeatedly, bent, wrapped and faulted leading to the present day most complicated structures exhibited by them. 10. Pick the mountain which does not belong to folded mountains. Explanation: The Mount Agung is an example of a volcanic mountain whereas the rest are folded mountains. 11. Which type of mountains are common in Basin and Range province of US? Explanation: The side blocks in faulted mountains may be of mountainous heights. Horst and Graben are often complimentary structures. This type of mountains are typical in occurrence in the Basin and Range province of U.S.A.
12. Peninsular India in reality is residual in nature. State true or false. Explanation: Many highlands on Peninsular India are in reality residual in nature representing parts of rocks exposed to erosive work for millions of years.